WebHostingPad Review 2019: Is WebHostingPad a Good Hosting? WebHostingPad is without a doubt one of the most affordable hosting services provider on the market with great packages. WebHostingPad has been in business since 2005 and since its inception has worked on the principle of putting the clients’ needs first. Their aim is to offer the best hosting service with an efficient support staff helping you along the way. What makes WebHostingPad user-friendly is its Weebly website builder. You can use the free website builder to create professional websites without the need of any programming knowledge. This not only saves you the website developer expenses but also lets you design the website exactly the way you want it without getting into cumbersome details. Installing applications like WordPress, osCommerce, ZenCart is as easy as clicking ‘next’ in the installation wizard. These applications are easily manageable without detailed programming requirements so you can publish a blog or create an online shop with no programming knowledge whatsoever. The feature that attracts most people to WebHostingPad is that it doesn’t put restrictions on the available features. You get unlimited storage, databases, email accounts, domains, and bandwidth which, for this price, is not offered by many hosting services providers. To encrypt the data transferred through the website and to authenticate the site, you can use SSL certificates offered by WebHostingPad. You have to pay a yearly fee for them or opt for the Power Plan Plus where its included in the package. 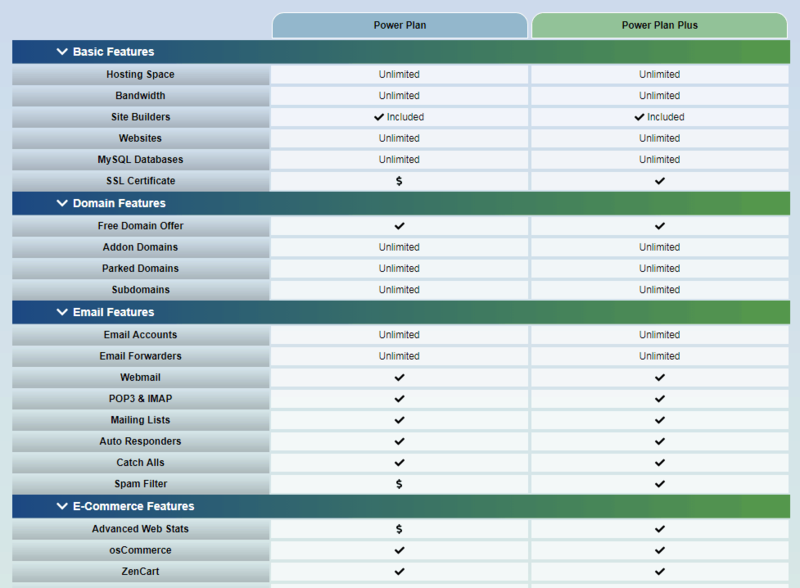 WebHostingPad offers only two hosting packages: Power Plan and Power Plan Plus. Both the packages are as cheap in comparison to other providers. They both contain unlimited disk space, bandwidth, domains, subdomains, databases, and email accounts. The Power Plan Plus features the SSL certificates whereas, in the Power Plan, you have to pay for them. Similarly, advanced web statistics are only available in the Plus plan. You can pay in a one-year to five-year payment cycle. The longer time period you pay in advance, the more you save on your hosting. They also have a 30-day money back guarantee. Through the support center, one can access both the knowledge base and the ‘Submit a Ticket’ sections. Both of them work quite effectively in getting your problems solved. For quicker solutions, you can always use the live chat but it is not offered 24/7. You can also contact them by telephone or email. Cheap hosting and unlimited packages are how you can best describe WebHostingPad. Make sure you check out the renewal rates before buying as they can be different from the original offers. Wondering how WebHostingPad stacks up against other Web Hosting companies? Enter any other Web Hosting company and we will give you a side-by-side comparison.